It’s May, so that means we’re leaving for West Virginia next month!! Getting ready to visit WV always makes me think about lighting. Last summer we relied heavily on battery powered lanterns, flashlights, and a couple USB light bulbs. Unfortunately, our lanterns and spare batteries were stolen in November’s break in. I’m not keen on buying a whole new batch of lanterns. Instead, I’m thinking about getting new wicks for some kerosene lamps and lanterns that are already on site. Lighting by fire has a certain romantic appeal, doesn’t it? Thinking about lanterns made me wonder about how to make my own lanterns. This, in turn, lead to today’s project – a DIY lantern from a recycled can! This project is a bit different from other DIY lantern tutorials you’ve seen. It has a fun, beachy vibe and would look lovely on a long summer night. 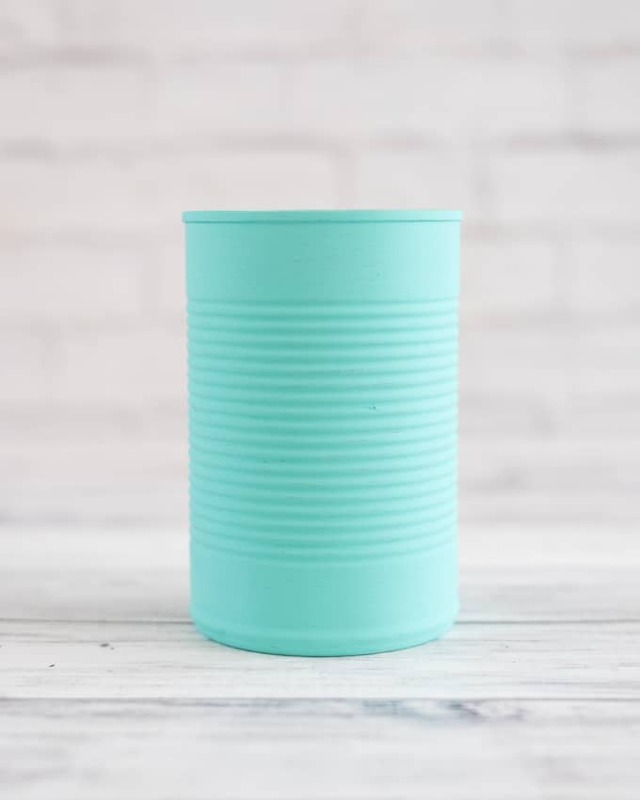 Fill your recycled can lantern with citronella oil to help keep bugs away outdoors, or use a cooking oil you already have at home indoors. 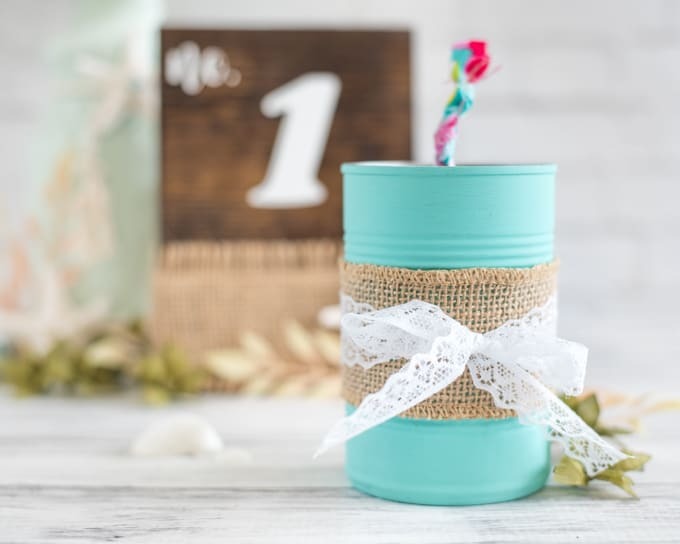 Either way, this DIY lantern is a great way to recycle a can into something cute! 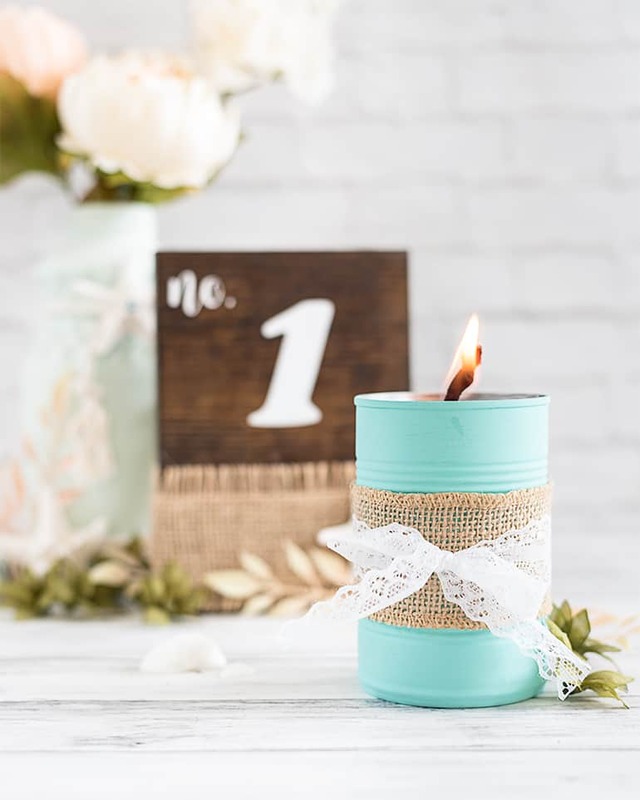 Although I automatically gravitate towards beachy projects, you can absolutely alter the way you decorate your lantern to match your decor. 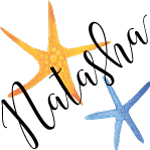 Don’t feel constrained by my choice of colors and embellishments! This project is amazingly flexible from the size of the can you choose to recycle, the oil it can burn, and even your wick material. 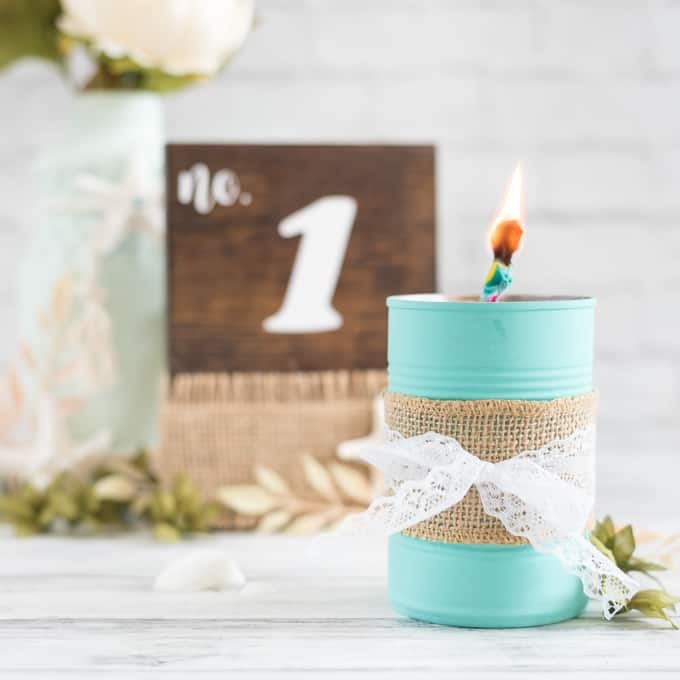 You probably already have everything you need at home for this DIY lantern, so let’s jump right in! A can! While cutting the lid, make sure to leave a tab of about an inch attached. 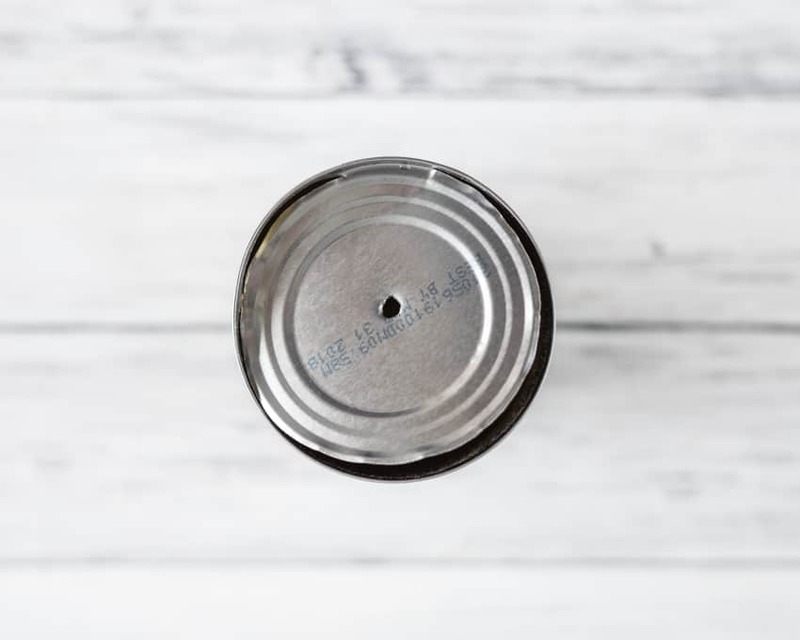 Use a table knife to carefully lift the lid, pour out the contents, and clean the can. If you’re not ready to use the contents, just transfer them to a container and pop it in the fridge! A hammer and large nail or screw -or- a drill with a smallish bit. Paint. I used CeCe Caldwell’s chalk paint (I’m not an affiliate, I just love having no VOC paint on hand! ), but you could also use acrylic. Wick material. All you need is something made from natural fibers. You can purchase lantern wicking, or you can just use whatever is around the house. A piece of jute twine, strip of cotton fabric, or another rope/twine made from a natural material will work. A piece of copper wire or a metal paperclip – totally and completely optional/hopefully not needed. If you accidentally make the hole too big, you can wrap the wire around your wick to keep it from falling in the can. Embellishments. Seashells, lace, twine, flowers – whatever strikes your fancy! Glue. Original Tacky Glue is my favorite! Open your can, being sure to leave the lid attached for about an inch. Carefully lift the lid with a knife, remove the contents, and then wash the can out. Very carefully bend the lid back so you can place it against a block of wood, work bench, or another surface you can hammer/drill against. Make a hole in the middle of the lid. Size the hole to your wick – make it large enough to insert the wick, but not so loose that the wick falls through. You can use a pair of needle nosed pliers or a file to enlarge the hole slightly, if needed. Paint your can! I used three coats of chalk paint. Pro tip: wrap the head of your paint brush in plastic wrap between coats to avoid having to wash and dry it multiple times! Add your embellishments! I used some burlap and lace, but use whatever you’d like. Just make sure you don’t put anything around the top that might come into contact with the flame! Fill the can at least half way with oil. Carefully bend the lid back down, using pliers if necessary. Please don’t cut yourself! Allow the lantern to sit for a few minutes until the wick becomes saturated before lighting it. Enjoy! You can carefully pull the wick up with a pair of pliers, as needed, as it burns down. 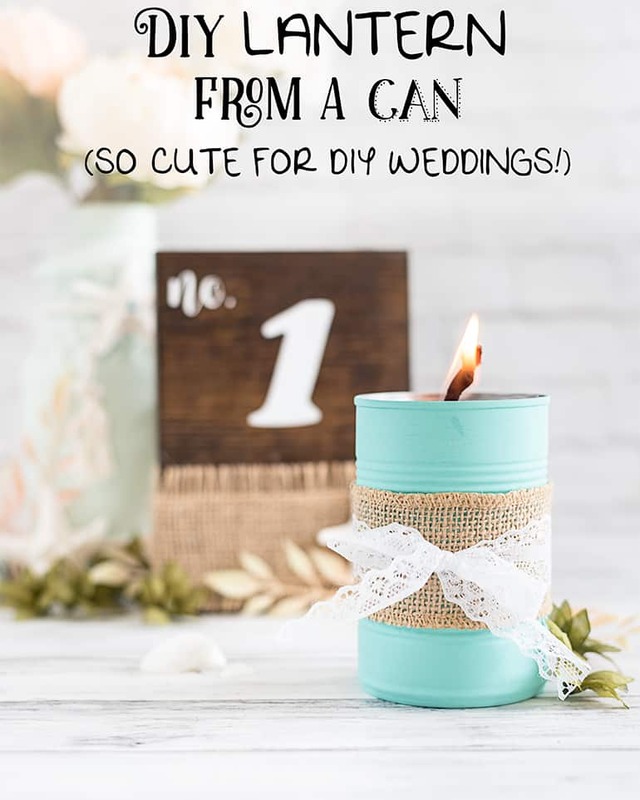 Wouldn’t these lanterns be super cute at a summer get together or a DIY wedding? 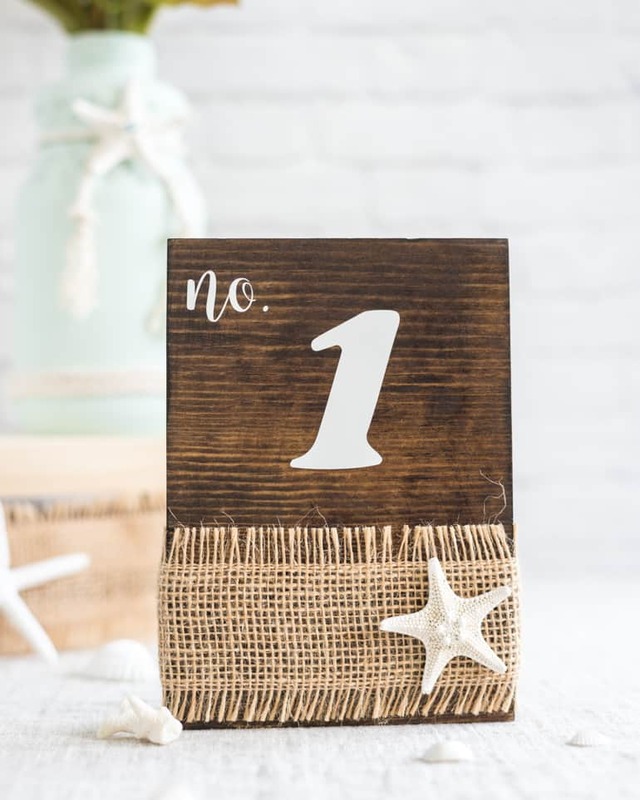 PS – You can learn how to make the beach wedding table numbers in this post right here! Of course, a less elaborate version of this lantern would work fantastically in a power outage! 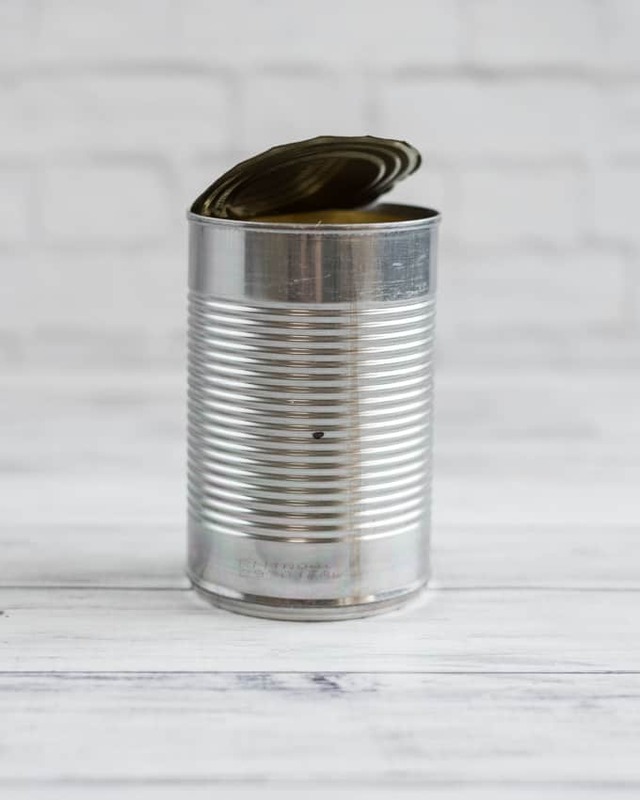 In an emergency situation, drive a nail through the center of the lid before using the can opener, open the can and toss the contents, insert a wick, and put the lantern to use. Have you ever made an oil lantern? Are you making summer vacation plans yet? How to Paint Transparency Swatches with Watercolors is Live on Skillshare! Thank you! I painted a set of shelves the same color – they’re very cheery! Super cute! 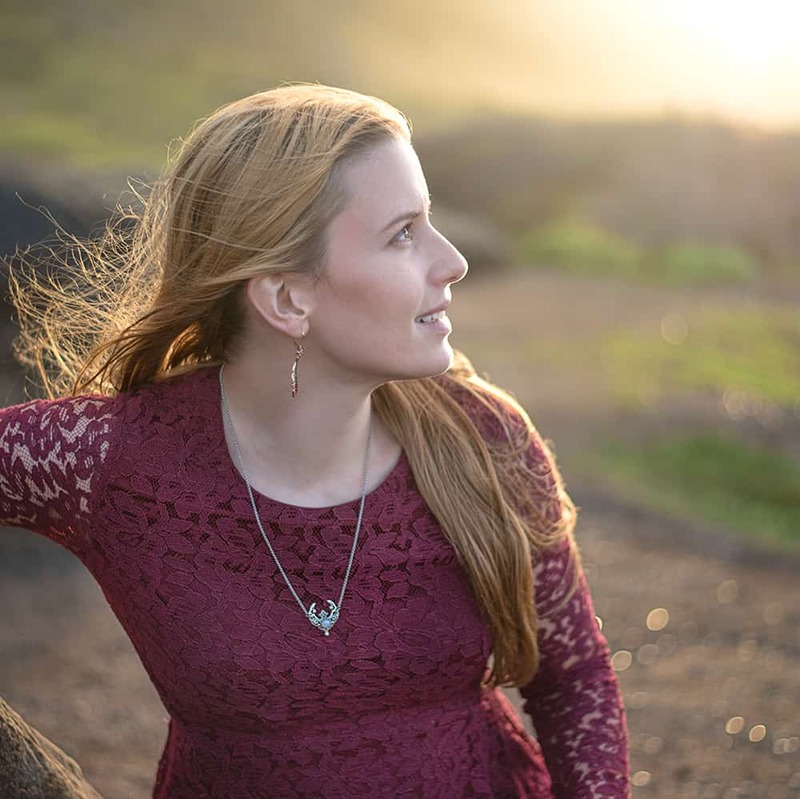 And yes, totally customizable! I’d be scared of knocking it over and the oil. But that’s just me and my clumsiness!